This creamy, comforting mushroom soups, rich in phytonutrients, B vitamins and minerals, makes a delicate, healthy vegetarian starter or serve small portions in shot glasses for great, wholesome canapé. This soup can be prepared in advance and then warmed up just before serving. Add the reserved mushroom after re-heating it. Put the dried porcini in a bowl, cover with boiling water and leave to soak for about 10 minutes. Peel and finely chop the onion. Peel and crush the garlic. Wash and chop the parsley. Peel the chestnut mushrooms and finely slice. Warm the olive oil in a saucepan, add the onion and garlic and sprinkle with a little salt. Cook on a low heat for about 5-7 minutes until soft. Strain the porcini and roughly chop. Add the chestnut mushrooms and porcini to the pan, sprinkle with the chopped parsley and a little salt and sauté over a medium heat for 10 minutes, stirring frequently. Remove a couple of spoons of cooked mushrooms and reserve for garnishing. Make up the stock according to packet instructions. Pour the hot stock into the pan and simmer the mushrooms for a further 15 minutes. Meanwhile, warm the milk. Melt a small knob of butter in another saucepan, add a teaspoon of cornflour and whisk to a paste. Add the hot milk and carry on stirring until the sauce has thickened. Blitz the mushrooms and stock in a liquidizer or with a stick blender. 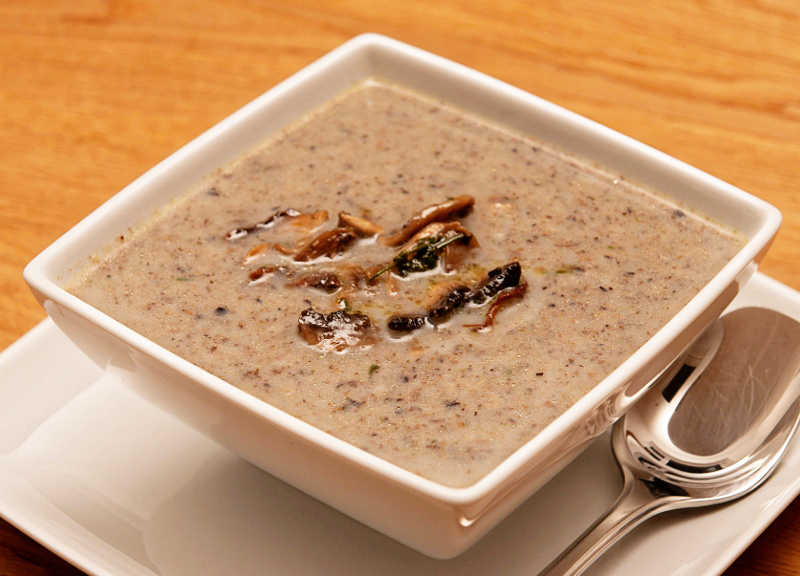 Add the creamy sauce to the mushroom soup, stir to combine and cook over a low heat for a couple of minutes. Remove from the heat, sprinkle with a generous grinding of black pepper and spoon into warmed bowls. Top with the reserved mushrooms and serve immediately.